This last weekend I got to yet again go to the NY Ren Faire, just me and Ariel. We even got to see a few shows, including Belly Dancing! I got pretty much beginning to end of the Dance of Isis. Just breathe-taking. The performers are part of Gimmie Shimmy, belly dancers brought to the Shire by Captain Raith Kell's GPS (Gypsy Procuring Ship in case you didn't know). These girls definitely know how to put on a show let me tell you. It was amazing and beautiful, though I am a bit bias as I love belly dancing already. 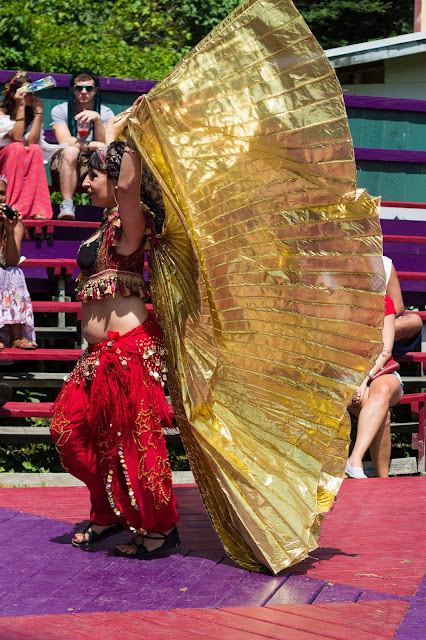 This prop in belly dancing is called Isis wings. They are amazing, aren't they? Trust me my photos don't do them justice, they are gorgeous while in motion. She used them to tell the story of Cleopatra's plea to the goddess Isis when the Romans came to claim Egypt. It was stunning. The way she's swirled and moved. I was entranced. Ariel went and sat with our friends meanwhile I couldn't keep my finger off my shutter button. I wanted to go closer but didn't want to crop off the wings. It was so mesmerizing. I did in editing crop some of the photos, I thought the image above was stunning in a blur. Like the wings were taking flight. To watch her move and the smile she wore on her face the whole time. This is someone that loves what they are doing. I mean how couldn't love belly dancing and be applauded? Well me actually. I definitely belly dance but in my room, alone, when the kids are asleep. I couldn't resist taking a bokeh type photo of her when the sun was shining off the wings. For future reference, there were many more photos taken. Photos of the other dancers, photos of the faerie girl Ariel, photos of the performers, of wares. It was amazing how much more I could take in when I had only one kid with me. 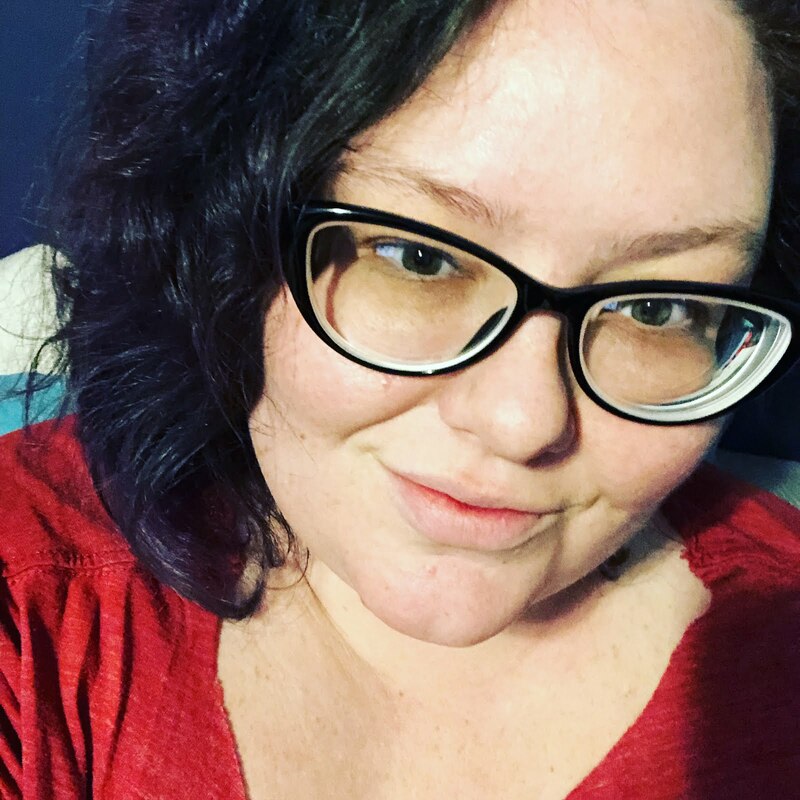 The Archer and I are going for a date day soon and I'm sure I will be able to get enough more since we are going to try and see all the things he didn't even know were there. Like the Living Chess Match. 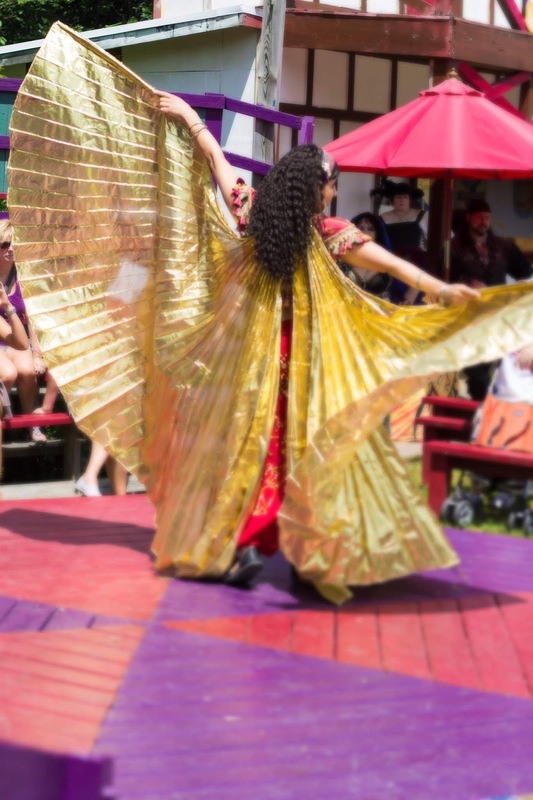 I have decided since I took so many photos that turned out great, that I would break them into groups of posts so that you have more time to immerse yourself in the imagery of the New York Renaissance Faire. I did a shoot for a friend wearing these you can see it on pinterest folder. Gosh I love a good pair of Isis wings. Beautiful pictures! I love those golden wings. 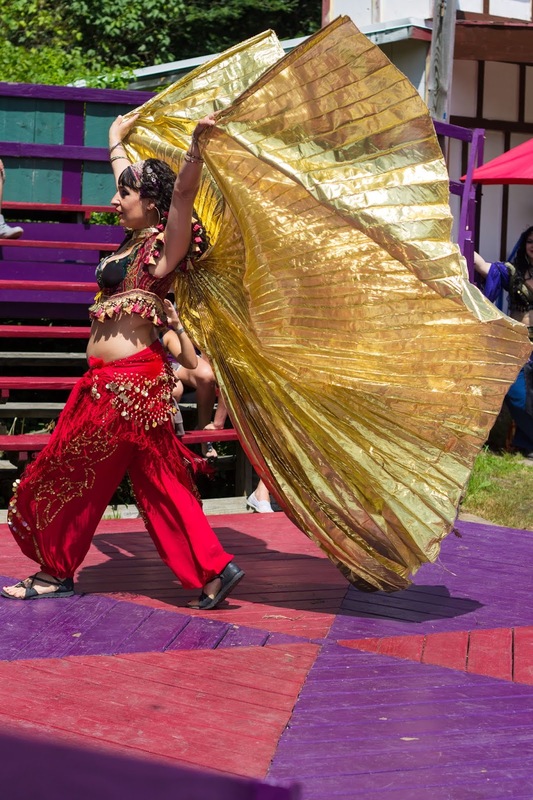 I didn't realize that belly dancing incorporated story telling. I love the story of Cleopatra. That bokeh picture is really pretty. All the pink, purple and gold... it's like a mosaic! It really captures the feeling of being mesmerized. Thanks for sharing with us at Photog Show and Tell link party! It's like the oral tradition, they are telling a story through dance. I got a Siren Dance this last time! Very cool! That would definitely be awesome to see live, those belly dancers can do amazing stuff! That they can! They are amazing to see in person.